Izintaba Game Farm - Vaalwater Accommodation. Situated on a private game farm, just 290km's north of OR Tambo International airport, outside of Vaalwater in the Malaria Free Waterberg Biosphere, Izintaba offers self catering accommodation in six luxury, fully equipped self-catering cottages. Sleeping between four and fourteen people Izintaba Lodges are perfect for groups of friends or family get togethers, intimate weddings, romantic bush getaways or just a well deserved weekend break. Izintaba Game Farm offers guests the freedom to enjoy the bush at their own pace either walking, mountain biking, fishing, birding or doing a game drive on our 1200ha private game reserve. Izintaba (which means "a place in the mountains") is home to a wonderful selection of birds, all the general plains game from Giraffe to Impala and innumerable species of reptiles and insects. The area is blessed with a temperate climate all year round and is malaria free. Leave the city stress behind you and come and enjoy true peace and tranquillity in the Malaria free Waterberg bush. At Izintaba we believe that a stay in the bush can be enjoyed in style and comfort. 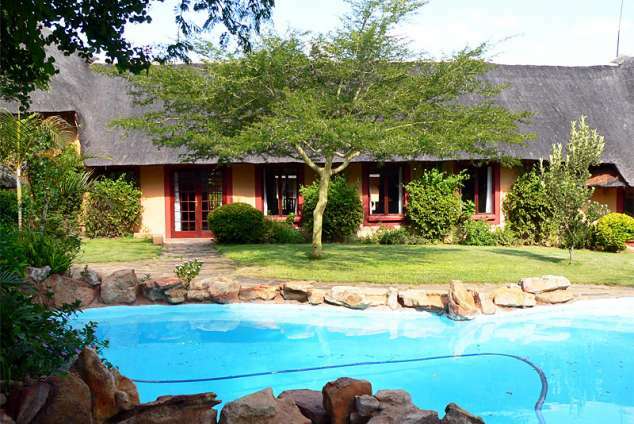 The thatched lodges are luxuriously furnished, very comfortable and overlook typical Waterberg bushveld. At the end of the day guests can relax on their patio and anticipate the magnificent sunset; make a wood fire in their private lapa, watch the incredible night sky and savour the heady scents and wild night sounds of the bushveld. Each lodge sleeps 4 people in 2 en-suite bedrooms, with an open-plan lounge, dining room and kitchen. Zebra lodge has a loft, which can sleep an additional 2 people. A larger double story lodge, which sleeps 8 people in 4 en-suite bedrooms, with an open-plan lounge, dining room and kitchen. Own private plunge pool. Originally built as a home, Giraffe cottage has been converted into a spacious chalet with an open plan dining room, lounge and large kitchen that makes big family or friend get togethers comfortable and hassle free. Sleeps 10 people comfortably in 3 large bedrooms, one king, one double and one twin, with 4 beds in a spacious loft room, ideally suited for children. 2 full bathrooms, both with a shower and a bath. Fully equipped for self catering with all crockery, utensils, bed linen and towels; 4-plate electric or gas stove with oven, microwave, fridge/freezer; fireplace in the lounge, shaded stoep (veranda); shaded carport and thatched lapa for outdoor dining and a private braai (BBQ) area. Ready cooked meals can be ordered and delivered to your cottage on a daily basis. Please enquire about our menus. Join us for a 2-3 hour guided game drive, on an open landrover, followed by a 3-course dinner around a raging bonfire at our bush braai site situated in the middle of the bush under the African sky. A good network of farm roads enables the cyclist to enjoy riding in the bush. Tracks are either smooth or 4x4. There is always the possibility of coming face to face with a Zebra or a Giraffe around the next corner! Alternatively, the public roads outside the farm have very little traffic and offer longer rides. Izintaba offers a diversity of habitats from open plains to rocky kloofs, to dams and seasonal rivers. This enables it to support a wide selection of wildlife. Guests can join us on an open vehicle for a guided game drive or drive in their own cars to look for game. Most roads are suitable for sedan cars and only a few require 4x4. A map of the farm is provided on arrival. Izintaba supports a wide range of fauna and flora, and because we do not have any dangerous game, the best way to take it all in and enjoy the beautiful scenery is on foot. There are game paths and with over 25km of roads on the property one can enjoy long easy leisurely walks. For the more energetic, there is a marked walking trail leading down a scenic kloof, which has waterfalls and rock pools in the rainy season. Discover the joy of bird watching with over 200 species recorded in the area. Check lists provided on request. Cool off in the large swimming pool set amongst granite boulders. The flora is very diversified due to the variety of habitats. It's a wonderful hobby to walk about identifying trees and wild flowers with a good reference book. Pack a picnic and enjoy the surroundings at one of our picnic sites. There are endless possibilities for the keen nature photographer, especially as guests have access to all areas of the property, including a few hides. Bring your own rod or use one of our to test your patience against the barbell and bream that can be caught in our dam. Over 40 mammal species are found on Izintaba game farm, large and small. These include giraffe, zebra, kudu, eland, waterbuck, blue wildebeest, gemsbok, bushbuck, blesbok, mountain reedbuck, klipspringer, duiker, steenbok, impala, bush pig and warthog. Predators such as leopard, brown hyaena, genet, civet, black-backed jackal, caracal, and African wildcat are occasionally sighted. The elusive aardvark, pangolin and honey badger also occur on the farm. The Waterberg boasts over 200 bird species. These include raptors such as snake eagles, buzzards and secretary birds as well as numerous different kingfishers, hornbills and sunbirds. Innumerable species of insects and reptiles occur, including the endemic Giant plated lizard. Izintaba offers a wide range of habitats and scenery. A perennial stream, which feeds a dam and provides an interesting wetland that attracts a variety of water birds, wide open savannah plains where game is easily viewed and dense bush and rocky outcrops. On the northeastern side of the property a densely vegetated horseshoe ridge looks out on an endless vista of mountains and valleys with no sign of civilization. It is down this ridge that a number of rocky ledges and beautiful seasonal waterfalls can be found. Take the N1 North from Johannesburg, turn left towards Nylstroom/ Modimolle at the Kranskop tollgate. Travel through Nylstroom towards Vaalwater (60km). Turn right at the Melkrivier sign and travel 35km. At the Dorset sign turn left on the dirt road. At the fork carry on towards Werkendam (± 20km). Izintaba Lodge is on the right hand side just past the dam. 36018 page views since 14 Feb, 2007.